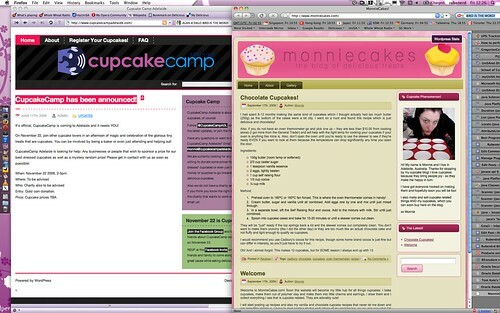 This picture was originally from my blog post about Monnie's MonnieCakes.com (which I couldn't go to because I had an exam the next day and had to study, ugh! ), but it demonstrates how I use tab thingys. It'll make sense after you read this post, trust me. I hope :). Unlike a few months ago when I was eagerly using the latest beta versions of Firefox 3.5, I've especially needed my machine for studying over the last few weeks so I haven't had the chance to check out the latest beta of Firefox 3.6. I'm really not fussed about the ugly Personas feature that'll make your browser look like a throwaway from the 1990s, but according to Stephen Shankland Firefox 3.6 also handles tabs differently. Specifically, when you open a link in a new tab, it appears immediately to the right of the active tab. Before, the new tabs would appear to the far right of the strip of tabs. I've read a few people on The Twitters who abhor the feature, but as someone who's already used to it because Tree Style Tabs implemented it, I have to say that after the initial disorienting confusion subsides (a few minutes tops) you quickly become far more productive. By keeping them organised in this fashion It's easier to keep track of which tabs were opened from where which is especially useful when you start opening hundreds of them! While we're making tabs more useful, the next step is for Firefox to have true side tab support. As far as I know Opera is the only browser that supports them natively, and while Tree Style Tabs does a fantastic job stacking tabs along the side of my browser windows which allows me to have more of them open and know where they came from, it'd be nice to have the option whenever I do a clean install. I suppose at that point we start getting into the debate over what constitutes a feature, and what's more useful and practical having as an extension to keep the base software small. Though with the increasing bloat and sluggishness of Firefox in general that seems to be a moot point :P.